The Honeyguide is a type of bird that will lead certain animals, most notably the Honey Badger, to beehives. The bird will then wait for the Honey Badger to break open the beehive and to have its fill. 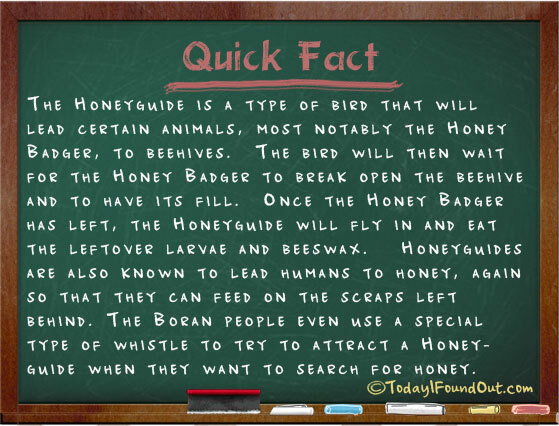 Once the Honey Badger has left, the Honeyguide will fly in and eat the leftover larvae and beeswax. Honeyguides are also known to lead humans to honey, again so that they can feed on the scraps left behind. The Boran people even use a special type of whistle to try to attract a Honeyguide when they want to search for honey.